Tipping is a universal custom on Kilimanjaro and on safari and has always constituted a significant proportion of a guide or porter’s salary. It is alleged that there are even companies operating locally that do not pay their staff any salaries and that these workers rely exclusively on tips. Team Kilimanjaro do not pay the very highest daily wages to our staff as this would equate to an increase in our prices, a reduction in the number of climbers who feel able to afford to climb with us, and a diminished annual salary and volume of work enjoyed by each staff member, which is something they would not welcome. 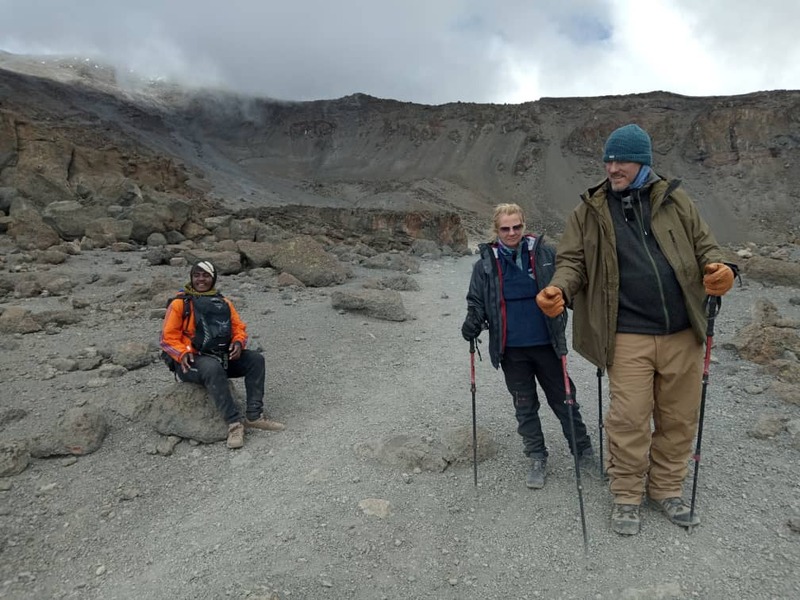 However, we believe that the daily salaries that we pay are amongst the top 10% or so, and that our top guides and their core support staff likely enjoy the highest mean annual incomes on Kilimanjaro. Our mountain staff are generally rewarded very generously by grateful climbers, though we are often asked for guidelines for recommended tipping amounts. Since the concept of the tip derives from free will we prefer to advise on the basis of what we have observed that our climbers choose to tip, rather than requesting specific tip amounts. That said, since the vast majority of our climb groups - probably not less than some 97% - are willing to tip within the guidelines detailed below, where a climb group is unable to do so, the guide will often have difficulty explaining to his crew why a particular tip value is substantially lower than the norm, as it will automatically be assumed that since the allocated value to be given to each porter is lower than what is customary on similar climbs, that the team may have displeased the climb group and may begin trying to investigate the cause of the assumed errors and the identity of the imagined perpetrators. A guide is trained to handle such eventualities and should see them as a welcome test of the strength of his leadership and character. However, if unable to budget at least 10% of the total amount paid for the climb, some climbers may feel more comfortable requesting details from TK about slightly cheaper climb options that are available with our sister companies. It would appear that the simple rule of thumb seems to be that climbers tend to tip between 10 and 15% of what they have paid for their climb. In other words, where a climber is a member of a large group of 8 climbers and completes say, the 6 day Machame Route, each climber will usually choose to contribute around USD 200 to 300, with the exact amount being dependent on a number of factors including the climbers’ own culture of tipping (Americans often tip very liberally, while say, the French are somewhat more conservative); the performance of the crew; and of course the available financial means of the climbers. 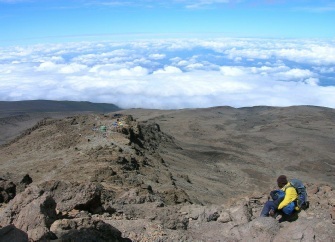 With smaller groups, the overall staff to climber ratio is increased and so climbers tend to tip more, but since our per climber climb costs increase as the booking group becomes smaller, the relationship of scale between the amount tipped and the amount paid for the climb, still remains roughly the same, with each climber in a group of just a pair climbing TK Rongai over 7 days, usually tipping around USD 300 to 450 to their support team of 12 staff. For those interested to know how guides can be expected to divide tips for larger groups please download this Kilimanjaro guide’s tip calculator (Excel document), which aims to mimic the criteria that our teams apply. Readers will notice that as the climb group becomes larger it is usual that the chief guide’s own share becomes disproportionately increased. The reason for this is that whereas when group sizes increase, the volume of work and responsibility borne by other members of staff doesn’t really change - or, if anything, is slightly diminished - as groups become larger the responsibilities and pressures on the chief guide are correspondingly augmented. Ordinarily the sum of all the contributed tips is collected together and presented to the chief guide at the gate when leaving the National Park. The guide then divides this amount himself amongst the crew. As will probably have been inferred from the above, it is not necessary to tip all the staff individually; indeed doing so will remove the guide’s prerogative to reward workers that only he knows have worked especially hard, often behind the scenes away from the attention of climbers. If further advocation of this position is sought we are happy to refer climbers to a detailed discussion of this matter that is available to read elsewhere online. That said, it is generally reassuring to climbers to know that members of the support team that they feel ought to be rewarded differently, in acknowledgement of their especially conspicuous diligence and conscientiousness, are indeed credited. In the hope of balancing the need to ensure that the guide’s control and authority of his staff is maintained, and the climbers’ own wishes are considered, Team Kilimanjaro details a suggested implementation of their tipping procedures in a format which we strongly encourage climbers to print and to take to the mountain with them. To access this recommendation, please see our printable Kilimanjaro tipping procedure document. Should climbers tip with large or small notes? Dividing the tips is a mathematically complex exercise that is assisted by having as small a denominator as possible, as each guide will assign a different number of sub-roles amongst the porters, and it is not unlikely that in a group of 12 porters, there will be at least three or four different tiers of reward. It is very important that each sub-role be rewarded differently, even if subtly so, as the acknowledgement of these different sub-roles is an important motivator in impelling porters to aspire to work ever harder and attract more responsibility from the chief guide, by improving their position within their team as they strive to acquire a slightly superior sub-role, en route to eventually being recommended as a summit porter and thereafter to train as an assistant guide. The guide is responsible for assigning these sub-roles with respect to his own personal leadership model and will have already ranked all of his staff throughout the climb, having carefully watched everyone and made a mental note of who is volunteering for extra duties, or who is going the extra mile. With these factors being so involved, it is very hard to achieve an accurate division in dollars, so the guide will usually send someone to quickly exchange the dollars for Tanzanian Shillings - while the climbers are having lunch in Moshi, or else will hand out a larger dollar amount to another senior team member that he delegates should subsequently exchange and subdivide this amount on the behalf of a number of the men, once they are in Arusha together. The local bureaux des changes and banks in Moshi and Arusha penalise transactions that involve small note values. The most competitive exchange rates at the biggest banks (which require accounts and to which mountain staff likely will not enjoy access - particularly at the requisite short notice immediately after a climb) involve a loss of approximately 5%. Realistically however, with the chief guide being under time pressure to arrange an opportunity to exchange the tipped dollar amount, he will have to use a local money changer in Moshi, or an after hours changer in Arusha. None of these options will offer a competitive rate for small notes and it would not be unusual for a loss of closer to 10% - as against the large note value - to be applied to the transaction. By giving a tip in USD 5, USD 10, or USD 20 note denominations, while aiming to be as kind as possible, a climber will effectively be reducing their tip by some 10% or more, which is probably very much counter to most climbers’ intentions that their staff should be rewarded to the highest degree possible. Why do Team Kilimanjaro not simply apply a 10-15% service surcharge and include the cost of the tip into the overall climb cost? It gives greater control to the guide over his team as porters know that the chief guide (and not the office) is responsible for the division of the tip. This then motivates porters to be obedient when allocated unpopular tasks as they know that slacking and insubordination will be punished via a reduced share of the tip, and working hard as a good team player will be rewarded with an enhanced share. It ensures the highest possible level of service delivery a team is capable of by making the climbers instrumental in the incentive process. It achieves this by being a safeguard against complacency in the sense that people of all cultures will, to our minds, work harder if they know that their remuneration is going to be indexed to how hard they have worked and how well they have performed. It eliminates the need for porters to register as taxpayers according to Tanzanian tax legislation, with effectively around half of their take-home funds being accrued via a non-taxable means. Employees in certain trades receive tips which form a substantial part to their income. The payments of tips received from the employer or a third party as a reward for services rendered in the course of the employment are taxable. Payments given as a present in appreciation of the recipients’ personal qualities, such as faithfulness, and consistency and readiness to oblige, would not be taxable. How should I interpret it if one or a handful of porters secretly supplicate me to bypass the normal TK suggested tipping procedure? We mention this, as although it’s very rare, we do receive a handful of reports a year, particularly originating from the very midst of the busiest months when our support staff requirements are such that we are having to augment our core numbers with additional porters that spend most of the rest of the year working as freelancers for several other trek operators, picking up habits and tricks that we would prefer not to have our own loyal workers exposed to, but which during February and September is sometimes sadly unavoidable. Additionally, if even one of our top guides has failed properly to follow correct TK pre-climb preparational procedures that involve accurate weights being taken of all luggage, and appropriate weight distribution of loads amongst his porter team, then we may come up short-staffed as deemed by KINAPA’s weighing scales. In this event we will have to hire freelancers at the gate, who again, have no consolidated team ethic and have often learned how to capitalise on the propaganda disseminated on the Internet by foreign-owned companies and aimed at discrediting local budget-oriented operations by accusing them of cruelty towards, and exploitation of workers. Since experience has taught us that the vast majority of our climbers are intelligent, perceptive, reasonable and realistic people, TK management prefers to be as transparent as operationally and tactically possible. In line with this, climbers should please understand that where a guide has committed an error of judgement with respect to pre-weighing supplies and has to hire additional porters at the gate, it is unlikely that he will choose to begin his new relationship with the climb group by explaining that he has breached operational procedures and has to hire freelancers, and that you should please nonetheless give him the benefit of the doubt, remain reassured and have unbroken confidence in his ability safely to lead you over the course of the next few days, into a potentially hostile wilderness environment, without any further administrative errors. Instead, he will likely aim to welcome the new porters as honorary TK staff and advise them that if they perform well and enjoy the work on this climb, they should subsequently approach the office for consideration for regular work. It is unlikely then that it will be evident which porters are TK staff and which are freelancers. An impeccably written and preserved letter, written in almost perfect English by a local copywriter, and available to buy in Arusha or Moshi for around 5,000 - 10,000 Tsh (around USD 3-6), is left in the tent of the person judged by the renegade porter to be either the leader, or else the most susceptible to solicitations of misplaced sympathy. This letter usually explains something to the effect that the guide is not a fair man and cannot be trusted to distribute the tip fairly and will likely keep everything for himself and give little if anything to the porters. Why climbers need not be concerned about the possible veracity of such round-robin letters as they apply to TK is that all TK staff know that if it is agreed by a handful of staff that the guide behaves unfairly towards his men, any member of staff is able to approach our local coordinators in secret, under some private pretext, and to communicate his concerns to the office. We will then call in witnesses from the team, men whose reputations we know well, and ask for an independent assessment of what happened on the climb in question. Where we find that the accusation is true, the guide faces the prospect of demotion. In the last few years this has happened to one guide in 2006. He was dismissed from service with TK and has not worked with us since. Where we are naive and we fail to perceive unreliable accounts as such, and an unfair guide is allowed to continue his unfair practices, the system will soon automatically demote him as porters will request not to work with him and he will struggle to assemble sufficient numbers of TK porters for his next climb. We will then understand that there is a general attitude of dissatisfaction with the men generally against him, and he will naturally become relegated to serve as an assistant guide, working under the auspices of someone with better leadership values. As will be obvious to most of our readers, the ability of the guide to determine the extent of the inequality of the distribution of tips, allows him to maintain a safer and more synergistic level of control over his team, since it quickly becomes known by those under his necessary authority that shirking (by, for example, pretending that one’s load is too heavy to move fast enough to be amongst those in the team that will have the task of putting up tents with sore and unresponsive hands in sleet, and instead timing one’s arrival into camp to coincide with shelter having already been erected) will be punished via a reduced share of the overall amount tipped; and that going the extra mile , racing into camp to help with admin, staying up late at night cleaning pots, or rising early to help to prepare breakfast while colleagues and the climb group enjoy their much needed sleep, will be rewarded with an enhanced share of the total amount tipped. Where, therefore, a porter has no wish to follow the orders of a guide - who is of course accountable both to TK management and to the climb group themselves, for a safe and unified performance of his team - the porter will prefer to take this responsibility for tip distribution away from the guide (who he knows is observing him closely and monitoring his performance, attitude and effort level) and place this burden in the hands of people that he believes are not aware of his insubordinate attitude , because they are not being employed to oversee his performance but are properly trying to optimising their hydration, nutrition and rest by maximising their time spent relaxing at meals, or resting and sleeping in their tents. We are very gratefully blessed to have some of the best and most loyal and hard working porters on Kilimanjaro, to serve our climbers. These porters are - on the whole - themselves grateful for the regular work that we are happy to be able to offer them, and as a body they enjoy working cohesively in their teams. However, of the 250 or so expeditions that we run each year, it appears that half a dozen or so of these might suffer such challenges as we have just described. We are genuinely sorry to those climbers who find themselves in such circumstances but would please ask that they simply understand what is happening and encourage their guide by reassuring him that they have not been duped, are not naive, that he need not be embarrassed by the behaviour of these porters, that they respect his authority over the group, understand the challenges that all positions of leadership entail, and that they stand behind him. We are very thankful to those of our climbers (many of whom themselves occupy positions of leadership) who are able to support us in this way. Want to join one of our scheduled climbs?